Ok, so this is a Tor heavy entry. I didn’t plan it like that, but sometimes you finish a book and you want something with the same emotional resonance and, often times, you can get that by going to another book from the same publishing imprint. Apparently, this mood was historical magic. I looked at this book in hardcover two years ago, but for whatever reason, never got around to buying it. I can’t think why. It’s right up my alley; Jane Austen-ish, but with magic. Sign me up! Maybe the cover was understated enough that I thought it wouldn’t be fun? I think it’s a beautiful cover, don’t get me wrong. I can’t really explain why I didn’t pick it up. The reason I got it this year is because the sequel came out and, obviously, the series has been repackaged. 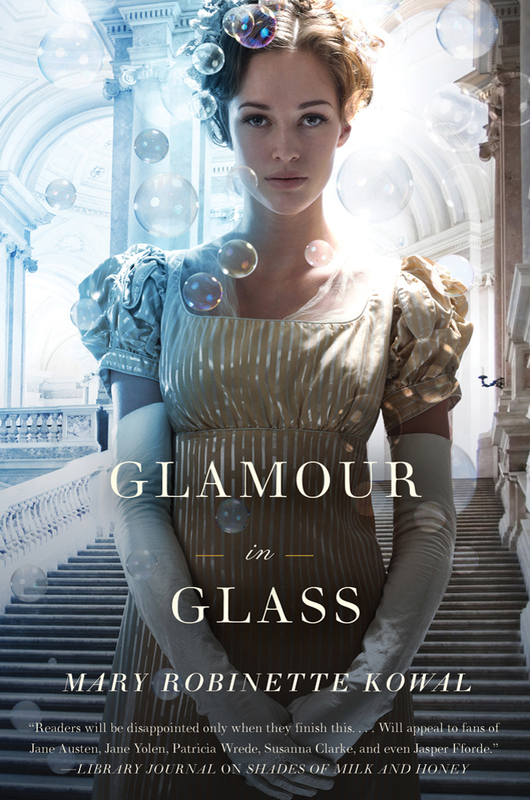 Glamour in Glass was mistakenly shelved in the YA section and when I went to move it I thought, ‘Gee, that looks awesome.’ Then I saw that it was the follow up to that other book I had never gotten around to picking up. So, I got both. Congratulations cover design department, you did your job! The set up of the story is straight out of Jane Austen. The Ellsworth family has two daughters; Jane, the older sister is more talented, but Melody is the family beauty. Jane has more or less resigned herself to being an old maid and someday living on the charity of her sister’s husband. 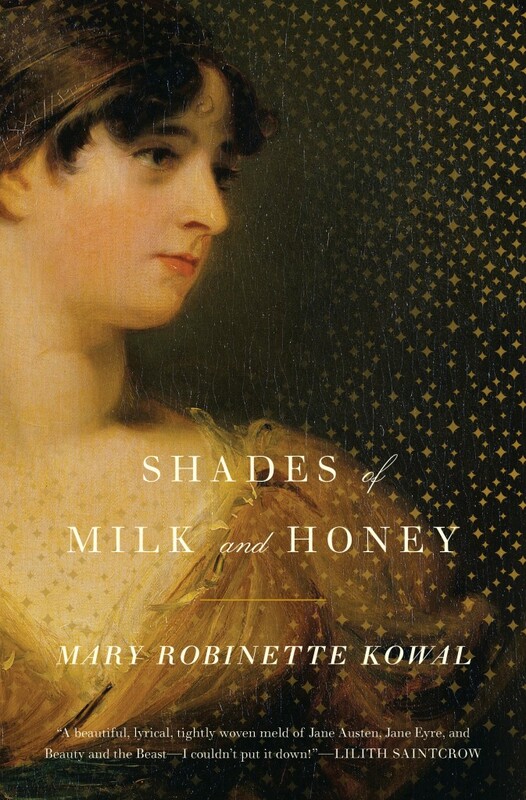 The difference between this book and your average Regency era novel of manners is the world that Kowal has built. In this world magic is readily available and young ladies of breeding are taught how to weave glamour the same way they are taught to play the piano forte or cover screens. Drawing rooms are decorated with glamour tapestries and debutantes with slightly less than perfect physical features can cover them with magic, for a short time. Jane, though plain, eschews such deception and meets the world with her own face. If her skills and personality cannot persuade a man to marry her then nothing shall. Melody, though somewhat ham-fisted with her magic is lovely enough that she should find a husband with no difficulty. Difficulties arise when both girls develop an attachment to their neighbor, Mr. Dunkirk. There are also the complications of Mr. Vincent, a master glamourist working on a tapestry for the Lady FitzCameron, and the lady’s nephew, Captain Livingston. Secrets, meetings, betrayals, and magic all weave together in this most excellent novel. I finished Shades of Milk and Honey and couldn’t quite settle on another book. I had an advance copy of Ironskin so I thought I’d give it a whirl. I ended up reading it all in one sitting. So, it was quite a whirl. I also like the cover. I’m not convinced about the accuracy of the fashion on the cover, but it’s pretty so I don’t care. 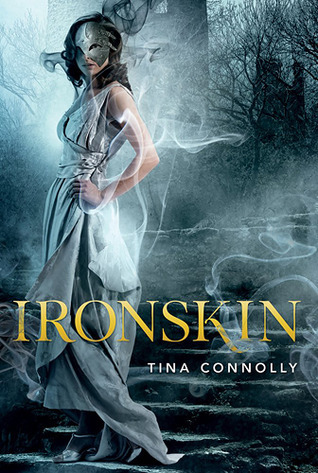 Ironskin is set in an alternate England that never had an industrial revolution as such. They never needed to. They bought technology and the power supplies to use it from the fey. The blue packs were totally clean energy, the technology they could run was on par with that developed in the 20th century; electric lights, motorized vehicles, moving picture stories. All kinds of wonderful inventions free for the taking. Until, suddenly, they weren’t free at all. The Great War began when the fey rose up against their trade partners. Fey bombs exploded on the battlefield, killing many and imbedding the survivors with magical shrapnel. The fey have the ability to take over the bodies of the dead meaning that every bomb dealt double damage killing humans and creating more weapons for the fey to use. The war took a toll on England, vast stretches of battlefield are no longer inhabitable and the wounded are everywhere. Jane Elliott is one of the wounded. They are known as Ironskins for the iron coverings they must keep over the fey shrapnel imbedded in their bodies. Each piece of the fey magic comes with a curse that can infect those around them if it isn’t bound by cold iron. Jane is especially unlucky. Her curse is rage and the scars are on her face. She wears a sort of half mask of iron and cannot hide her injury from the world. Her curse has limited her employment prospects. Everyone understands about the wounded, but no one really wants them around. On the verge of desperation, Jane takes a job as a governess at a house on the edge of a fey wood. The child, Dorrie, is fey touched herself and her father, Edward Rochart has his own secrets. I really enjoyed this book. It has obvious parallels with Jane Eyre, but Connolly does a good job of not making it a flat retelling. Jane shares many of her literary predecessor’s traits. She is very self-conscious about her appearance. She is drawn to the enigmatic Mr. Rochart, but backs off when more attractive women take the field for his affections. She is a bit more proactive than Miss Eyre however. When she discovers that Mr. Rochart’s secrets may very well endanger the country she takes rapid and decisive action. Miss Elliott is not fainting gothic heroine. She is a determined young woman who has finally found something worth fighting for.